My image from Our Daily Bread Designs is stamped in Black Archival on watercolor paper, then colored using the Marker Watercoloring Technique. I used a sponge dauber to add Chocolate Chip ink to all my card layers....(YES! I'm addicted to layers!) After my panels were all in place, I went back in with my Shimmerz, to add some sparkle to my card. Be sure to stop by Pat's Blog later today to see what she created, and to view the links of the other TJNL DT members who are playing today. Such a neat card...I love the sentiment! Great job with the CPS sketch this week! 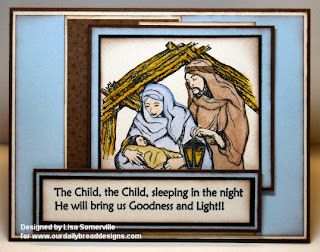 love that nativity scene and fab use of the cps sketch!